"Don't talk too highly about me, for I haven't done anything yet." This quote from Aung San, widely acknowledged as the founder of the independent country that is now Myanmar, resonated within me as my plane drifted towards Yangon. Some good things had been seen and done, yet I knew, deep down, that the main event still awaited. At any rate, besides seeing the last Rambo film in which Stallone describes the country as a war zone, I knew nothing of Myanmar; it awaited discovery. Oblivious to my inner musings, the plane landed softly, and without pretence. A relaxed atmosphere pervaded the airport, and the customs process was easy. Several friendly faces later, I found myself in a taxi gliding along the outer streets of Yangon. It was hot, but I paid no notice, being distracted by the swarming traffic around me; there were many cars, but no motorcycles or rickshaws. Not one. This had the effect of making traffic more congested, but far less noisy and chaotic. I later discovered that a 2003 ban was placed in Yangon on the use of rickshaws, motorcycles, and car horns, possibly to reduce injuries and noise pollution, although more amusing theories certainly exist. As my taxi slowly navigated the cumbersome yet quiet traffic, two roads diverged in a yellow wood of brick and concrete and we pulled up to the Chan Myaye Hotel. The street that I stood on was busy, but now it was not the traffic that diverted my attention, but the sidewalks, or rather the lack of them, being thoroughly ripped up and in the process of replacement. People crowded the road; most of the women seemed to have painted their cheeks with some kind of cream, which I learned later was called thanaka, a yellow-white paste made from the ground bark of certain trees, especially the thanaka tree, used to keep the skin healthy and smooth. I plodded upstairs to meet Nancy, the manager of the hostel, and Mong-Cho, the porter, who was determined to assist me with my single bag despite my deepest assurances that I could handle it. I went to bed early in the interests of staving off a looming upper respiratory infection, and woke up the next morning to a series of smiles from the staff in the hostel as they served breakfast. While drinking butter coffee I met Miguel from Portugal and Chris from Germany, and as they debated the different perspectives of their respective countries on the current fiscal situation in the European Union, I noticed how different they were from each other. I also overheard several other travellers mention that there was a popular route in Myanmar that everyone seemed to take, a kind of loop up into the middle of the country involving the archaeological site of Bagan, the city of Mandalay, and Inle Lake. I knew that my route might be somewhat different to this one, though I was still a little torn, and sorry I could not travel both, and be one traveller. I toured Yangon by foot over the next week. It is a big city with over five million people, and a busy contrast of old and new; as to the first, dusty colonial buildings and traditional wares abounded; as to the second, shiny modern cars and busy electronics stores lined the streets as far as the eye could see. In other ways though, western commercialism has yet to really invade this city; I walked many roads, and long I stood and looked down one as far as I could to where it bent in the undergrowth of the urban jungle, but those painfully familiar golden arches were mercifully absent. 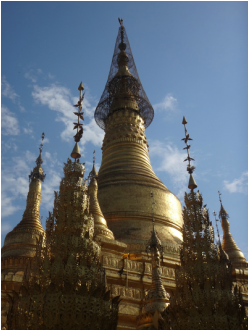 Since Myanmar is a Buddhist country, I made certain to visit two of the most important Buddhist sites within it - the Sule and Shwedagon Pagodas; a pagoda is a temple that serves a religious function, most commonly Buddhist, and it evolved from the ancient stupa. Located in the heart of downtown Yangon, the Sule Pagoda, allegedly over 2,500 years old, is topped with a golden spire and dominates the cityscape, most strikingly at night. 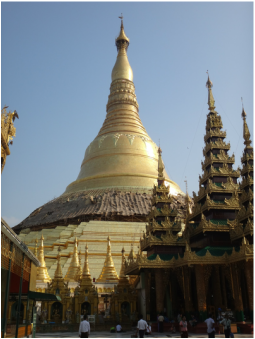 Even more impressive, the Shwedagon Pagoda is of a similar age but soars up to 99 meters (325 feet); it is covered in bricks plated with gold and is said to house relics from four previous Buddhas. Both pagodas provide an opportunity for people to meditate, contemplate, and perform rituals. Two of the more common rituals that I observed were bell-ringing, which symbolizes Buddha's voice and calls upon protective forces, and incense-offering, a gift of morality that reminds one of the path of moderation. After several days in Yangon, aside from giving a bit of money to some Buddhist monks, I encountered almost no beggars. Perhaps the needy people in Yangon are being cared for in other ways, or perhaps tourism is still new enough - and travellers still sparse enough - that the impetus for begging is not yet there. Some days later, I departed for Bagan. The street in front of the Chan Myaye Hotel in Yangon. Sule Pagoda watches the busy traffic. This young fellow needs some help to ring the bell in Sule Pagoda. Offering incense in Shwedagon Pagoda. Shwedagon Pagoda reaches towards the sky. A procession of fruit offerings in Shwedagon Pagoda. The top of Shwedagon Pagoda at sunset. The road to Bagan meandered through flat, dry forested land. The bus was comfortable, and not at all dangerous as a well-meaning colleague back in Australia - who had heeded the warnings against taking the bus when he had visited Myanmar a few months before me and so had never actually taken one - had described them to me. Spacious seats, air conditioning, and full meal service; been a while since I was in a bus with those amenities. It was over too soon, and before I knew it I found myself checking into the lively and somewhat trendy Ostello Bello Hostel. 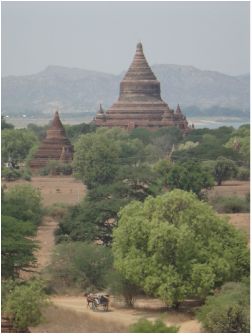 Bagan is the spiritual jewel in Burmese history. The name is derived from the Old Burmese word, Pyugam; its classical Pali name means "the city that tramples on enemies." Bagan was founded in the 2nd century AD, and from the 9th to the 13th centuries it was the capital of the Kingdom of Pagan, the first kingdom to unify the regions that would later make up the country of Myanmar. During their time, the rulers of the Pagan Empire constructed over 10,000 stupas, pagodas, temples, and monasteries across an area of 104 square kilometers (40 square miles); obviously, the city's culture was dominated by religion, yet as it grew in splendour it became not only a religious centre but a cultural, economic, and political one as well. In addition, Bagan was famously known as a pinnacle of secular studies including language, medicine, law, astrology, and alchemy. As is always the way, after a lengthy and illustrious time in the sunshine, the Pagan Empire finally collapsed in 1287 AD as a result of both internal decay and repeated invasions by the Mongols. Today, Bagan is not really a city in the usual sense of the word; the site is still dominated by the ancient structures of an empire long since vanished, and only a handful of scattered villages lie within and around it. Fortunately, although many of them have been destroyed over the centuries, over 2,200 ancient buildings remain structurally intact and as such, exploring Myanmar's most important archaeological site is like stepping back a thousand years into the past, although to be literally correct, most people do not step into Bagan; they ride around it. With hundreds of temples to see, a certain economy of movement is required, and since foreigners are banned from riding motorcycles in the area, the only viable option is to ride an electric bicycle, or e-bike. Not many things in life can compare to the combination of an e-bike, some dirt roads, a few hundred ancient temples, and the singular knowledge that the value of the day is to be found lost in exploration and contemplation. I was happy to experience several of these days. The morning sun, red and sullen, would illuminate itself into a brighter mood for most of the day, followed by an often abrupt exit into the ethereal haze of the evening's horizon. The birds were constantly singing; the wind, constantly speaking. That's not to say that the ride was always calm; on one occasion, while riding twenty meters behind a man on a motorcycle with an older lady riding with him, a large truck flew past me rather closely, and then did the same to them, except that the motorcycle driver inexplicably swerved right into the truck. The motorcycle crashed, with the old woman getting the worst of it as she smacked hard onto the road, and lay still. As the truck and motorcycle driver shouted at each other, I cursorily checked her out, but miraculously aside from a couple of nasty bruises she was fine. I stayed a while but unlike me, I think that they needed to be somewhere. On any given morning, several forks in the road would present themselves, each one leading to a different series of temples. I often paused at these forks to consider which direction I should take, but while one might look promising, I would laugh inwardly with the realization that there was no wrong way to go, and then take the other, as just as fair, and having perhaps the better claim, not for the reason that it was grassy and wanted wear, but that it was sandy and needed more tire-marks; there would be temples at the ends of all roads. While the temples in Bagan are of different ages, the passing of time there has worn them all really about the same; they are all old. Most of the larger temples were built in a style that became familiar to me as the days rolled by. The base level would consist of a large enclosed space, often containing four large Buddha statues, each one staring out in a different direction. If a second level existed, the search to locate the small passageway upwards to it was often a source of great pleasure. Many of these were small and cramped, and a trusty light source was required even during the brightest periods of the day to make one's way up the dark stairways so as to not inadvertently hit one's head on low-lying bricks. The second level would usually contain another, smaller Buddha statue. Higher levels existed in the larger temples, many of these containing steep stone stairways that could be climbed to their fullest extent, providing one with incredible views of Bagan, and a glimpse into time itself. Often I would be approached at the tops of the more popular temples and asked if I might pose for a photograph with someone; I was always happy to do this, even if I did receive some more than flattering smiles and stares. Despite it being a relatively touristy area of Myanmar, the people in Bagan were almost without exception extremely polite and pleasant, if not a tad quirky, and I have never met people who know how to combine shyness with a wide smile so effectively. When not taking photos, the more deserted temples provided the ideal setting for a morning of thinking, or perhaps reading. One particular book called Freedom From Fear stood out; it is a collection of essays written by and about Aung San Suu Kyi, the daughter of Aung San, the man most responsible for the independence and freedom of Myanmar, or Burma as it was called back in 1948. Aung San sculpted and trained the Burmese army as a symbol of freedom; he then used it to help drive out the British, and later on the Japanese, after which - having received the respect of virtually all of the many different ethnic groups within the country - became the first real leader of the independent country of Burma. Unfortunately, he was assassinated by a political rival at the young age of 32, not even a year before the independence he had fought so long for was finally realized. His daughter, Aung San Suu Kyi, lived overseas for many years but eventually returned to Myanmar to carry on her father's name and legacy. She endured fifteen years of house arrest but now she is free, and intends to run for the presidency in Myanmar's 2015 elections later this year, though she is banned from doing so by the current constitution. Aung San was perhaps the one man in the history of Myanmar who could have held the country together in the face of the numerous internal conflicts that have occurred since independence. Had he survived, where Myanmar might be today, I cannot say. Since the 40 degree heat could become uncomfortable during the middle of the day, some of the best times to go out and explore temples were in the cooler evenings, each of which would culminate in a rewarding sunset. I experienced several pleasant sunsets in Bagan, and occasionally one that was stunning. Sometimes, I could not resist exploring the larger temples afterwards, now devoid of people; walking through pitch black passageways with nothing but a small light, knowing not where one goes, has a mysteriously dark and playful appeal. After a few days in Bagan, I realized that I rather liked the place, and so decided to extend my stay from four days to two weeks; there was so much to do, so many things to see, that several days could not do it justice to my mind. The Ostello Bello Hostel had everything I needed for an extended stay, though I must say that even more than usual, most of the guests at this particular hostel seemed a bit forlorn. Some notable exceptions did stand out from the crowd - Rick from Canada, a true human being and road warrior whom I spent an entertaining day riding with; Maylis from France, a tranquil engineer in search of something; Toby from Canada, a philosopher and fellow of the highest grade; and Kelvin from Hong Kong, a personable lawyer and epic world traveller. No matter how satisfying the solitary reverie, good company from time to time is an essential component of any journey. The ensuing days were marked by more of the same, although many of those days additionally involved an event called Thingyan, also known as the water festival, a prolonged celebration that marks the new year in Myanmar. The water festival lasts for a full week, and during that week the days are full of music and dancing, and most essentially, water dousing; everyone makes sure that everyone else is repeatedly and copiously splashed, soaked, and pummelled with water. It made for some technically somewhat interesting e-bike riding, as I had to not only navigate the slippery roads, but also do so while having a large bucket of water splashed into my face. Nonetheless, in the spirit of the water festival, Toby and I had a competition of sorts - to see who would get splashed with water more times on a single e-bike trip into town; I managed to just edge the victory with a score of ten to nine. In the searing heat, the water was quite refreshing. Before I knew it, my two weeks was up. It had gone by so quickly. I spent my last evening in my favourite temple, Sinbyushin; despite being of reasonable size and boasting excellent views, it was marked as a small blip on the map, and perhaps for this reason if there was any temple that lay in leaves no step had trodden black, it was Sinbyushin. Bagan saved its most stunning sunset for my final day; the sun turned fiery red and hung over the horizon in a solitary and protracted vigil, resisting any attempts to be dragged down. Eventually it did go down, but not before letting me know, with a lingering whisper, what it was to be beautiful. Long after the sun had disappeared and the sky remained etched with the splintered remains of its scattered starlight, the wind carried on, and carried me home. Staying so long in Bagan meant that I now had no choice but to forego the popular route of Mandalay and Inle Lake in the middle of the country, if I wanted to still travel to some less popular areas to the west and south. After a brief period of consideration, I kept the first for another day and decided that I would have to visit Mandalay and Inle Lake some other time, yet knowing how way leads on to way, I doubted if I should ever come back - but one never knows. It was a long bus ride to Mrauk-U the following day. 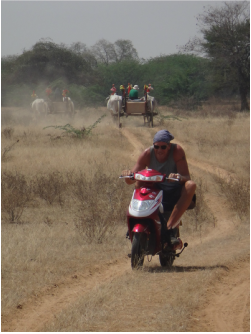 The best way to get around Bagan is by e-bike. View of a horse, carriage, and temples from Shwesandaw. View of several temples from Bulethi. View of Htilominlo from Shwe Leik Too. Grinding the bark from a thanaka tree to prepare the cream. View of Thatbyinnyu from Pathada. View of Shwesandaw from Pathada. Rick, the Road Warrior of Bagan. View of Sulamani Pahto from Pyathada. Water festival revellers dancing along the road to music. View of several temples from Lawkaoushaung. Contemplation atop Lawkaoshaung; well, not at the moment. Several young Buddhist monks march along the road. Sunrise view from Sinbyushin, the darkness recedes. Sunset view from Sinbyushin, whispering beautiful. With the road only opened to foreigners in recent months, getting to Mrauk-U required two bus journeys and proved to be a little adventure in itself. The first bus was beyond crowded, with all of the seats and aisles full of people sitting, squatting, or standing and items shoved into every conceivable nook and cranny. Despite the lack of space to move I enjoyed the authenticity and dubious distinction of being the only foreigner present, and everyone was extremely considerate. One young fellow asked if he could give my headphones a listen, and after nodding his head to the riffs from "Bridges In The Sky" by Dream Theater, gave me two thumbs up; it's difficult to find people who appreciate truly good music. When we arrived in the small town of Magway, I was the only person to get off the bus, and despite being in the third seat back there were about twenty people between myself and the door; since nobody could move, I tossed my bags out the upper window, and leaped out the window after them. I spent some hours walking around Magway - where I again saw no other foreigners and thus received a bit of visual attention - before boarding a night bus to Mrauk-U. Like the previous bus, it was chock full, the aisles crammed with people. As I drifted in and out of sleep, I felt flat land give way to mountainous terrain, and the motion generated by the endless switchbacks made several people sick to the point of vomiting. In the late morning of the following day, we picked up two more passengers, a father and his daughter; she looked about ten years old, and the motion sickness hit her hard. I did what I could to help, but was happy for her when the bus broke down on a lonely stretch of road, the engine sputtering and breathing its last. We disembarked, and spent the next twelve hours at a couple of run-down road-side restaurants as the bus mechanic tried to set things right. It took only minutes for the little girl to recover from her motion sickness, and her happy smile returned. I chatted for a couple of hours with an old fellow who introduced himself as Mr Theinlu, a retired civil servant living in Sittwe, a town on the west coast of Myanmar. Upon prolonged discussion it was apparent that Mr Theinlu had lived through much of the turbulence that has affected Myanmar over the decades, yet when I tried to tactfully broach this subject and mentioned the name of Aung San and how he might have changed things for the better, Mr Theinlu merely shrugged his shoulders and flatly stated, "Yes I know him, but I do not see it that way." I guess Mr Theinlu's life had been devoted to a government that while acknowledging Aung San as the founder of the nation, had gone to certain measures to diminish his historical influence; clearly, even a man such as Aung San has his critics. By midnight, a new bus had arrived to ferry us the last couple of hours to Mrauk-U and dropped me off at the Shwe Thazin Hotel. I caught up on lost sleep before renting a push-bike the following morning. In 1433, King Min Saw Mon established Mrauk-U as the last capital of the Arakan Empire, the origins of which may date as far back as 3325 BC and which at its peak controlled half of Bangladesh and much of western Myanmar. Being situated near the Bay of Bengal, Mrauk-U developed as an important trading hub between Burma and Bengal, India, Persia, Arabia, and later even European powers such as the Portuguese and Dutch; Mrauk-U became famous in Europe for its oriental splendour after Friar Sebastian Manrique visited it in the 17th century AD. It was strategically built as a defensive stronghold, with its pagodas constructed on hills to serve as fortresses, alongside moats, artificial lakes, and canals so that the entire area could be flooded. Like Bagan though, nothing lasts forever; Mrauk-U eventually succumbed to the Burmese Konbaung Dynasty in 1784. I didn't really need the push-bike on my first day, as the northern complex of temples happened to be only several hundred meters from my hotel. Being tired from my bus saga, I slept in, and didn't get started until noon, at which time the heat was stifling. Biking along, I was first greeted by Dukkantheim, a temple with a strange spiralling tunnel that drew me closer and closer to the middle before culminating in a lonely chamber dominated by a glowing Buddha statue. While not a perfect example, Dukkantheim did remind me vaguely of chaos theory - it appeared orderly from outside; wandering though the spiralling tunnel then gave me an impression of chaos; and finally, once I was in the middle chamber, a different, more subtle kind of order emerged from within the chaos. The people living alongside the temples greeted me warmly throughout the day as I explored the remaining northern complex temples. Riding past, many of the children would bolt out towards me, wave, and yell either "Hi" or "Bye-bye"; I am pretty sure that they meant for both of these expressions to be a form of greeting. I met only one other foreigner that day, a Canadian fellow named Nell, who stopped and chatted to me for twenty minutes while his guide waited patiently beside him. I continued along my road, and though I had only a rickety old push-bike and it was too hot, reflected that I'd never been happier. During that first day, I was again approached for photos, particularly at Shittaung; again I was happy to oblige. The more I interacted with the people from Myanmar - whether it was the person asking for a photo, the person serving me food, or the person saying hello on the street - there appeared to be a common singular element, which I can only describe as a patience of manner. I was glad for my push-bike on the second day, as the eastern temples were quite far. I traversed dirt, gravel, and paved roads to reach them, but finally made it to the largest temple, Kothaung, by noon, when the heat was again at its zenith. In the afternoon, I rode for several hours around the south and west of Mrauk-U, past children playing, boys playing soccer, and men and women working; looking past the temples, it reminded me of the lazy days of childhood, when my own world existed unbound by the limits of time. My final day was relatively calm. In the morning I met a fellow named Aye Sein who introduced himself on the street and asked me to take his picture. I returned to Dukkantheim later in the day to spent some quiet moments, and then stood on a hilltop overlooking the chaos temple. Life's true intent needs patience, so I stood there for some time, waiting both for the sun to fall and for a decision to rise; perhaps I shall be telling this with a sigh somewhere ages and ages hence, but I think, I hope, that I saw a way to do something good. Another rather long bus ride to Pyay awaited me the next day. The best way to get around Mrauk-U is by push-bike...well, not really. In Mrauk-U, the town and the temples are intermingled. Many people use umbrellas, not only for the rain but also to ward off the sun. Dukkantheim, the best temple to wander through alone. Ratana Pon Ceti, with temples dotting the ridge behind it. A man looks out from the edge of Shittaung. 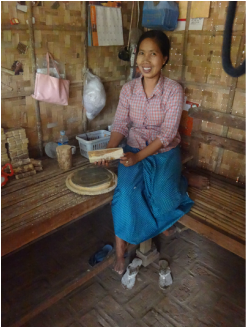 The people of Mrauk-U build their homes and farms around the temples. Kothaung, more difficult to get to but worth the endeavour. A long passage inside Kothaung, with Buddhist monks meditating within. Children running down a wet street after a thunderstorm. I had hoped that my bus to Pyay might be more comfortable, but it was not to be. Crammed from all directions, the seventeen hours to Pyay were long ones. As we drove past Pyay in the dark at 4 am, I gently reminded the tired driver that this was my stop. I was dropped off at some kind of toll station outside of town, where I jumped aboard a small truck full of ladies and their vegetables heading to market, thus finally arriving at Pyay in the wee hours of the early morning. I had not booked a hotel and knew nothing of the layout of the city, so I just started walking. It was still dark, but at least it was cool. It wasn't too long before a chap on a motorcycle pulled up and asked if I needed a "taxi"; I accepted, and hopped aboard. He shuttled me to the Mingalar Resort, an agreeable place, where I rested until the afternoon before heading out to see more of Pyay. Located on the Irrawaddy River, Pyay has a population of 123,000 people and its name means "country" in Burmese. The ancient city of Sri Ksetra lies a few kilometers away and may have been founded as far back as 78 AD. It was the largest walled city in Southeast Asia during its time. For reasons unknown, Sri Ksetra was abandoned and its inhabitants moved to Pyay's current position. While I saw only a handful of foreigners in Mrauk-U, I saw none during my two days in Pyay - not a one. I spent the afternoon at the Shwesandaw Pagoda, a huge structure that marks the city's spiritual and geographical centre and is said to contain a few strands of hair from Siddhartha Gautama, the Buddha. Shwesandaw is one meter taller than the Shwedagon Pagoda in Yangon, and captures magnificent views of Pyay, including the largest Buddha statue that I have ever seen. Exiting the pagoda, I bought some delicious grapes and loitered around town a bit, waving to curious onlookers and returning their greetings. One grinning little fellow who could not have been more than six or seven years old came running down the street right at me, yelling "Bye bye" as he ripped past. I wanted to see Sri Ksetra, so I hopped on another motorcycle for the fifteen minutes ride to the somewhat desolate ancient city. Sunset approached, and one of the ladies whom I paid my entrance fee to expressed her concerns. 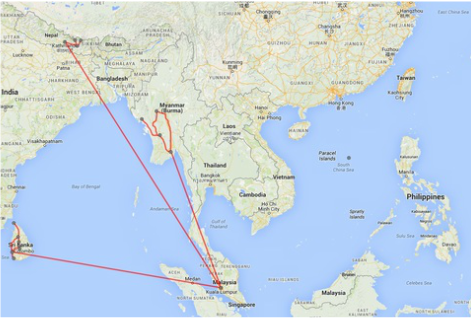 "But how will you get back to Pyay after dark? There is nothing here." "I will find a way," I mused. I started walking; it was serenely quiet, and the setting sun made the clouds sparkle. The lady was right, for I would soon be alone in the impending darkness, and yet I also recognized that in addition to preparation, luck is partially derived from a bit of courage; besides, even if I did get stuck at night in the middle of nowhere, it would be decidedly worth it. Twenty minutes later, as I stood where two roads diverged in a wood, a fellow on a motorcycle sped up behind me and offered to take me around the ancient city. I accepted, and as I got on, he said "Warm welcome from Myanmar"; I never quite got his name, but I think it was Kamonje. After showing me around Sri Ksetra for an hour until darkness overtook us, Kamonje asked me where I was staying and, without any request to do so, promptly drove me to my hotel. I planned to compensate him well for his kindness, but the man absolutely refused any offers of money, and after we shook hands, he sped on down the road. Kamonje seemed satisfied with the simple knowledge that he had helped someone; I won't forget it. My final bus to Yangon was comfortable, and the ride smooth. Pyay as seen from Shwesandaw Pagoda. Pyay seems to place such a priority on their tourists - of which I saw not a one - that they erected this sign in the middle of town. The mighty spire of Shwesandaw Pagoda. The largest Buddha statue that I have ever seen, dwarfing the buildings around it. A man contemplates in Shwesandaw Pagoda. 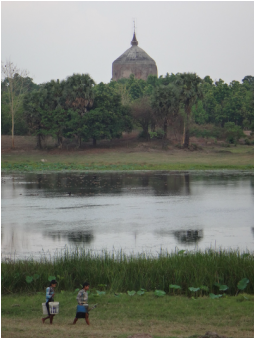 Two women walking in front of Bawbawgyi, an enormous stupa in the ancient city of Sri Ksetra. With Myanmar opening up to the world, it is a great time to visit. Both historically and geographically, it has many roads, some more comfortable and more travelled, others less comfortable and less travelled. The cowardly assassination of Aung San may have deprived Myanmar from taking a road less travelled, which of all things perhaps requires not only patience, but courage too. As to my own way, that remains to be seen, and I hope that it does indeed...make all the difference.